Crumbs and Cookies: swiss roll tower. "I want to run my own bakery in the future." I've repeated that line so many times that now my lips instinctively form those words everytime I'm asked what I want to be when I grow up before my brain even starts to process the question. But lately I've been thinking - do I really want to do that? It might come as a shock to those who have been witnessing me churn out cakes, cookies, tarts whatever sweet treat you could possibly name with untamable passion and devotion. Rest assured that I do not intend to stop baking, but I've been exploring possibilities beyond opening a shop. But what that is stopping me from realising that image that I've just described is this one very simple reason - I cannot repeat what I bake continuously for 6 or 7 days a week, and for (hopefully) years at that. Trawl through baking/cooking blogs and you'll find that the same recipe is rarely put up twice. The authors behind the blogs may have repeated the same dish, just that they don't post it again. But for me, when I post a certain recipe once, there is a 99.89% chance that I only made it that time and that time only. Only the extremely memorable ones see the light of my kitchen again. I just like to keep on creating new things, inventing new recipes. I get bored extremely easily, for the better or worse. That is why I cannot fathom repeating the same cake everyday; I don't want to become sick of the cake I once loved, I don't want to turn baking into a chore. I fully understand that no matter how much the owner of the bakery wants to innovate, it is not possible to endlessly change the menu and have an entirely different array of desserts every few days. There are likely to be customers who want certain items to stay, and you can't be so selfish as to deny them that. Moreover, a bakery is a business and you have to ensure it survives. "Teach someone else and get them to bake the mainstays for you while you handle the creation of new items" - I could, but I cannot. Because if I let that happen, I cannot wholeheartedly accept compliments for those desserts because those were not made with my own two hands. No, perhaps not just accept, but also because I don't feel worthy of those kind words. Therefore, I've been thinking that I could focus on blogging instead. Of course I don't think it's a very reliable option as a source of income - in fact it's quite risky in my opinion - but it's just a thought. I can continue to share my love for baking with others without restricting myself, but in the process I sacrifice real-life interactions with people. I hope that I can find the answer to what I really want soon, but in the meantime, let's shift our attention to this marvelous creation shall we? This is the result of mindless surfing of hashtags on Instagram. 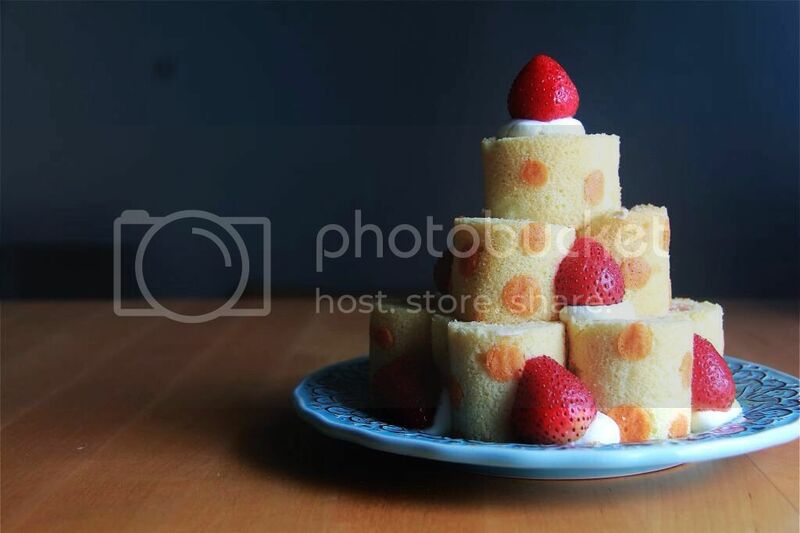 One day I keyed in ロールケーキ (roll cake, in Japanese) in the search box and several alternatives appeared alongside it, including ロールケーキタワー (meaning roll cake tower). I clicked on the latter out of curiosity and I was floored. Who would have thought that you could create such stunning structures out of swiss rolls?! This version you see here is but a very simplistic one. Some towers I saw had cakes that are each of a different colour and pattern and decorated with an assortment of cookies and fruits before finished with a ribbon tied snugly around the bottom layer. I was itching to recreate some of the best (i.e. crazy) versions I saw but this, I tell you, is mighty troublesome work. I made a pattern using only one colour and I had a whole mountain of utensils to wash up already. If I had made patterns of two or more colours I would have at least an extra bowl, spoon and piping tip to clean. I could only contemplate the amount of dirty dishes I would have to wash, soap, rinse and dry if I had made multiple batters of different hues for two seconds before fainting. It's not in my nature to repeat the same recipe twice, but you can count on seeing this one again, but of course in a different form! Make the cake: Preheat oven to 170C. Line a 10 inch square baking pan with parchment paper. Whisk the egg yolks and 35g sugar until pale and light. Whisk in the water, oil and vanilla until combined. Sift in the cake flour and stir until incorporated. For the pattern: Take 1 tsp of the batter and stir it together with the cake flour and food coloring mixture. Beat 1 egg white until stiff peaks are about to form. Add a pinch of cornflour and continue to beat until stiff. Add 3 tbsp of the meringue into the colored mixture and mix well. Hold on to the remaining beaten egg whites - you'll need it later. Transfer to a piping bag fitted with a small round piping tip and pipe your desired pattern onto the prepared pan. Bake for 1 minute. Continue with the cake batter: Beat the remaining 3 egg whites until foamy. Add in the 30g sugar and continue beating until the mixture is glossy and stiff peaks are about to form. Add 1 tsp cornflour and continue beating until stiff. Mix in the remaining meringue from earlier. Fold in the meringue mixture one-third at a time to the egg yolk mixture until no traces of meringue are left. Pour batter into baking pan with the baked pattern. Bake for 14 minutes or until an inserted skewer comes out clean. Remove from oven and cover with a new sheet of parchment paper. Invert pan onto a wire rack and unmould cake. Peel parchment paper from the bottom of the cake immediately and place it back on top of the cake to allow latent heat to escape. Leave cake to cool. Make the filling: Add the sugar to the whipping cream and whisk until stiff. Assemble the cake: Flip cake over such that the pattern faces down. Slice it into half. Make shallow cuts 2 cm apart on the surface of the cake. Spread the whipped cream evenly on the cake but leave a 1 cm space at the end opposite to the side you're going to roll from (which is by the way, the long side). You can choose not to use all the cream and save some for decorating the finished cake tower. Arrange the sliced strawberries on the cream. Roll the cake up and wrap it in parchment paper. Refrigerate for at least 1 hour. 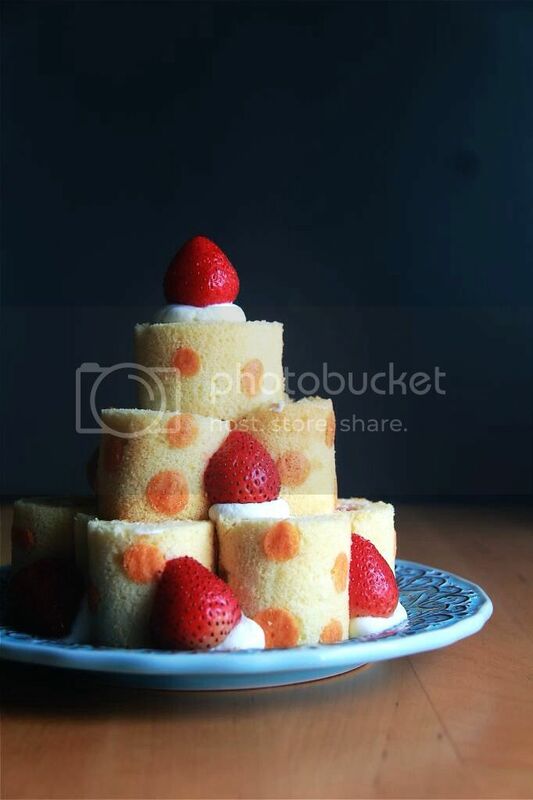 Slice the cake rolls evenly into 6 portions each. Stack them up to form a tower. There will be 7 on the first layer, 3 on the second and then 1 for the very top. 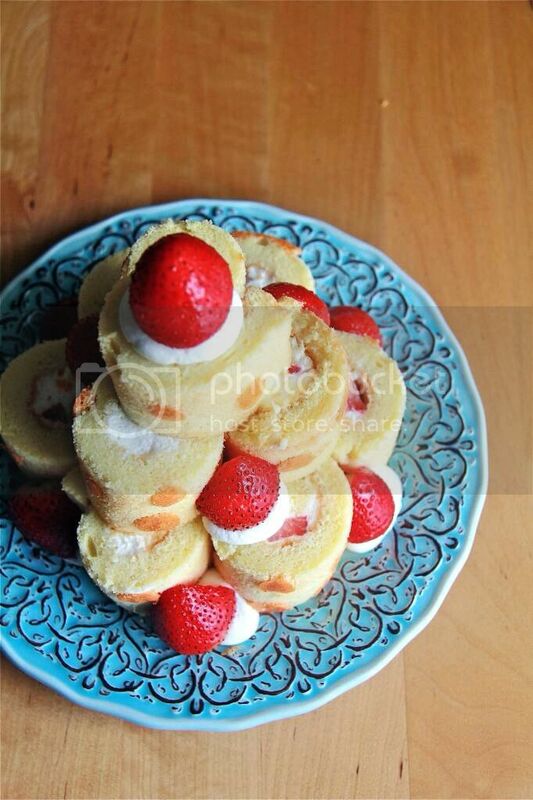 If you have extra cream, pipe little blobs in the spaces between individual rolls and then garnish with a strawberry. Consume immediately or within the day of assembly. What a great idea! I feel the same way about operating a bakery...also that it would be tons of work, and just blogging is much easier. :) Anyway this cake tower sounds fabulous! honey lemon brown sugar chiffon cake. milo chocolate peanut butter oreo buns.